The flag pictured above was made for an individual who wanted a replica of the company flag of the 43rd North Carolina Volunteers therefore the added lettering at the bottom of the red band. 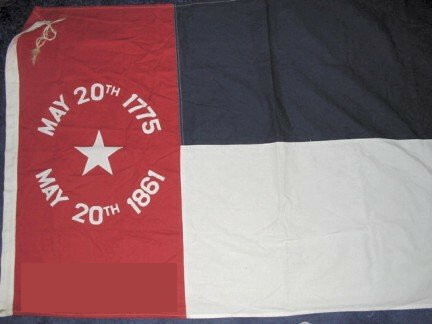 The flag shown was the state flag of North Carolina while North Carolina was part of the Confederate States of America. The flag as shown costs over $300. 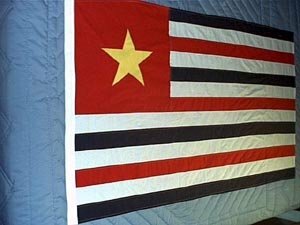 This flag without the "43rd NCV. Co. B" sewn on the bottom of the red band costs $300. Any decorations are extra. Louisiana's flag during the time Louisiana was part of the Confederate States of America. 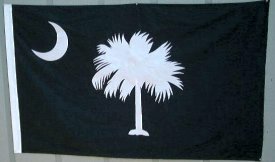 South Carolina's flag during the time South Carolina was part of the Confederate States of America. It is essentially the same as it was before and since the occupation of South Carolina by union troops.